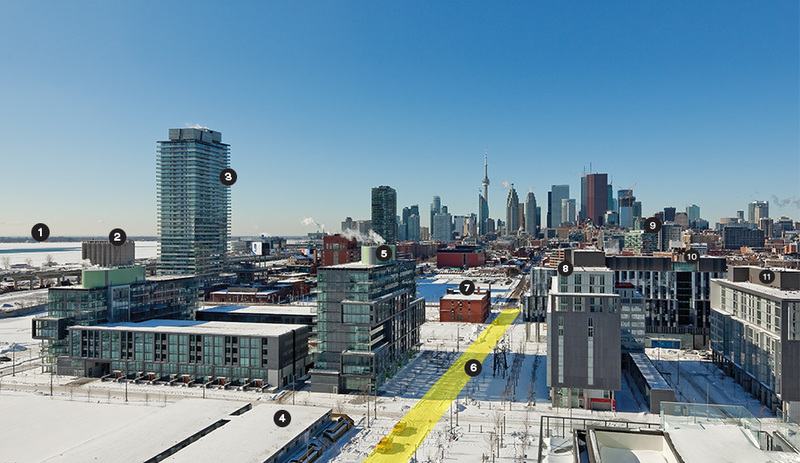 The Canary District in numbers: 1 Lake Ontario; 2 Victory Soya Mills Silos; 3 Clear Spirit Condominium, Distillery District; 4 & 5 Canary District Condos; 6 Front Street Promenade; 7 Canary heritage building; 8 Fred Victor affordable housing; 9 YMCA community centre; 10 George Brown College residence; 11 Wigwamen affordable housing. When the games begin in July, athletes from 41 countries will sleep on bunk beds set up in the brand new condos, college dorms and townhouses that make up the Canary District. The neighbourhood is built on reclaimed industrial land, just a 15‑minute streetcar ride from downtown. 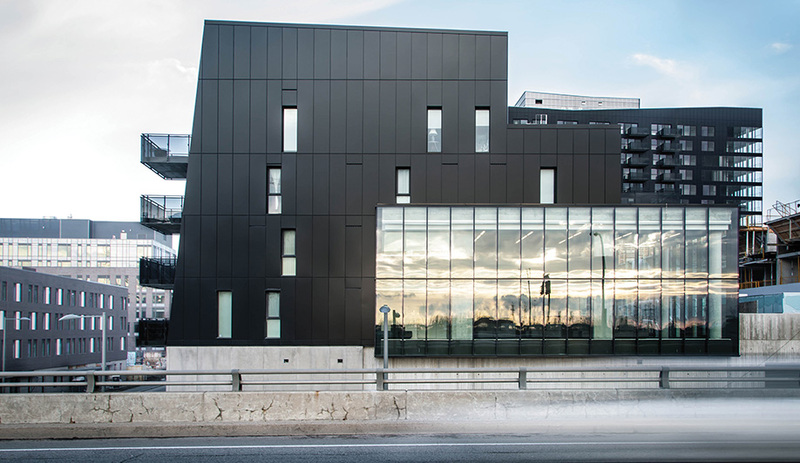 The George Brown College residence, by architects­Alliance, will house 500 students after the games. If any project merits the sports metaphors, it’s the Athletes’ Village, built on the east side of the city’s downtown core by Dundee Kilmer Developments in just 36 months – overnight in urban planning terms. The district at this time of year is still shrouded in snow, its glass buildings resembling architectural icebergs. A few days after the presentation, journalists were invited to crunch through the snow, and to engage in a dead-of-winter version of the question that has preoccupied the site’s planners for three years: what will this place be like when it’s full of people? While sports fans will be focused on the games, 10,000 athletes and team officials from 41 countries will have the run of this built-from-scratch neighbourhood. The athletes will claim their bunk beds in otherwise empty condos; they’ll share meals in a makeshift dining tent; and they will be bused out to the official sports facilities spread across the Greater Toronto Area and beyond. But to see how the village truly performs, we will have to keep watching long after the games end. In early 2016, the cluster of condos will be rebranded as the Canary District, and construction crews will step in to apply the final finishes (including installing the kitchens) before residents move in. Essentially, some 1,563 people will settle into this instant city, the first wave of many neighbourhoods to come. One of the River City condominiums, by Saucier + Perrotte. Developed by Urban Capital, the black-clad mid-rises were the first to stake a claim in the east end. Phase three will soon break ground with another dramatic S+P building, called RC3. “Cohesive diversity” is the buzz phrase architects and developers have been lobbing about to describe the project. By having the buildings designed by multiple firms – KPMB, architectsAlliance, Daoust Lestage and MacLennan Jaunkalns Miller – the aim is to achieve an assortment of structures. Ironically, this modern LEED Gold community begins with a gateway formed by two historic landmarks: the 1858 red-brick Canary restaurant and an old railway building across the street. Front Street has been extended to form a wide promenade separating two rows of discrete blocks. 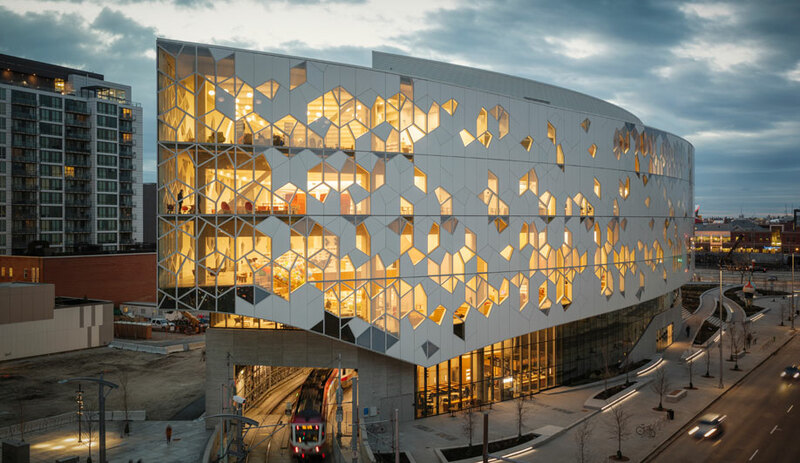 Toronto firm architectsAlliance designed the most outwardly exuberant building, the George Brown College residence. 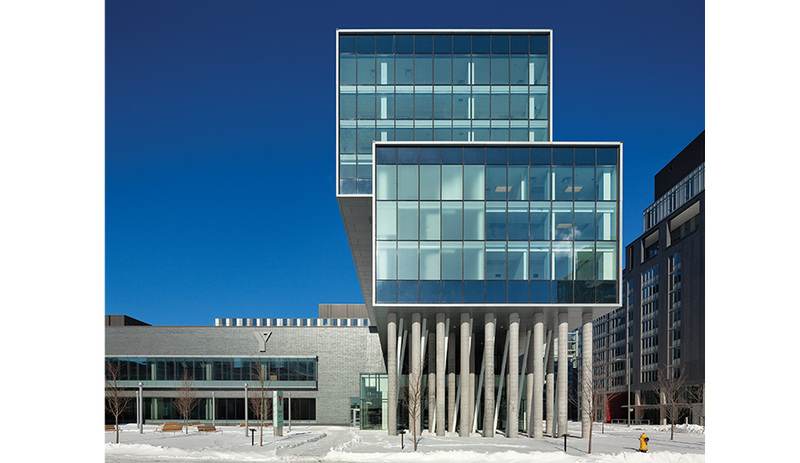 With an entrance propped on a cross-hatch of concrete pillars, the L-shaped seven-storey complex is set on top of a YMCA community centre designed by MacLennan Jaunkalns Miller, also of Toronto. 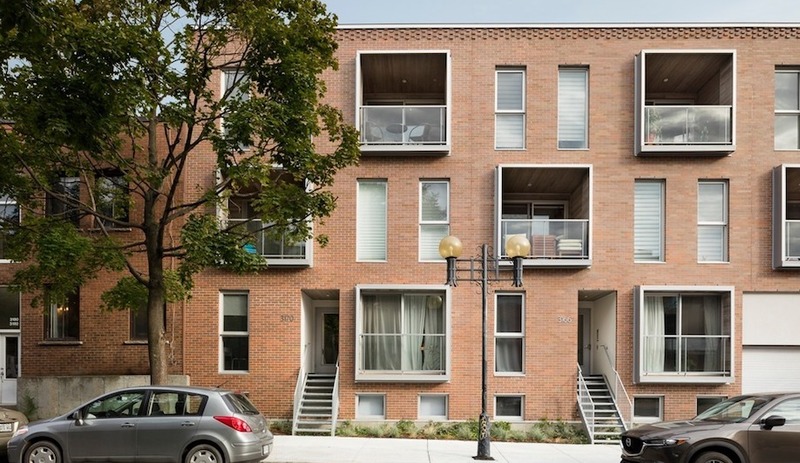 KPMB designed two condominium developments, one featuring a pair of mid-rise buildings made up of Jenga-like stacks; and two affordable rental properties, designed by Montreal’s Daoust Lestage, feature super-sized floor numbers cascading down their facades, and colourful archways that allow people to walk through one building to the other. Moving residents through, over and under buildings, and into shared green space, is the master plan’s stroke of genius. The neighbourhood is capped by a public park, Corktown Common, and it will be served by a new streetcar loop. It will also be wired to the hilt, with a broadband network and one of the fastest internet speeds in North America. 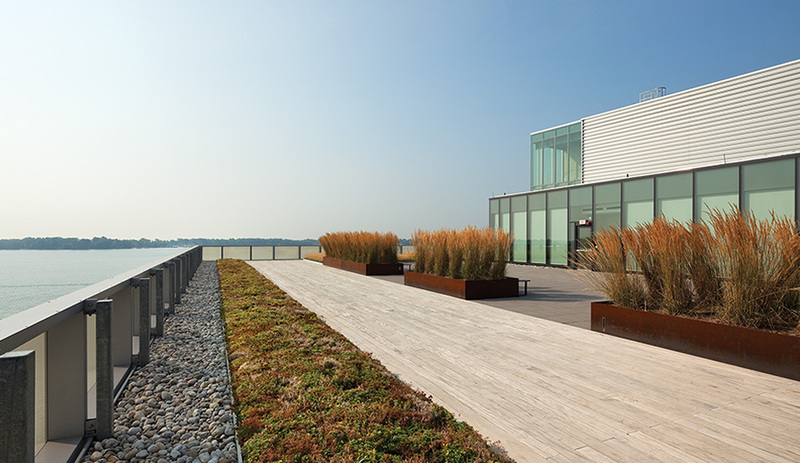 A view of Lake Ontario from the rooftop of the George Brown College Waterfront Campus. The school is about a 20-minute walk from the new residence. Zoom out from the marketing hype, and Athletes’ Village/Canary District is Waterfront Toronto’s most prominent development and the face of the city’s eastward expansion. Nearby, River City, 1,100 units designed by Saucier + Perrotte of Montreal, continues to take shape. Launched by developer Urban Capital before Toronto won the Pan Am bid in 2009, the private project was a first foray into this no man’s land. “There was absolutely nothing, except pink pipes coming out of the ground,” recalls principal Gilles Saucier. From the shard-like black mass of the first buildings to the drawer-like units and balconies that define the latest tower, RC3, these are radical and visionary for a city with far too many predictable towers. River City’s best idea – to place social and playground amenities (including basketball hoops and skateboard ramps) underneath the Gardiner Expressway – was so ingenious the city ran with it, and turned it into Underpass Park. The dynamic programming that now defines the east end is the result of long-vision planning and commitment in the face of controversy. 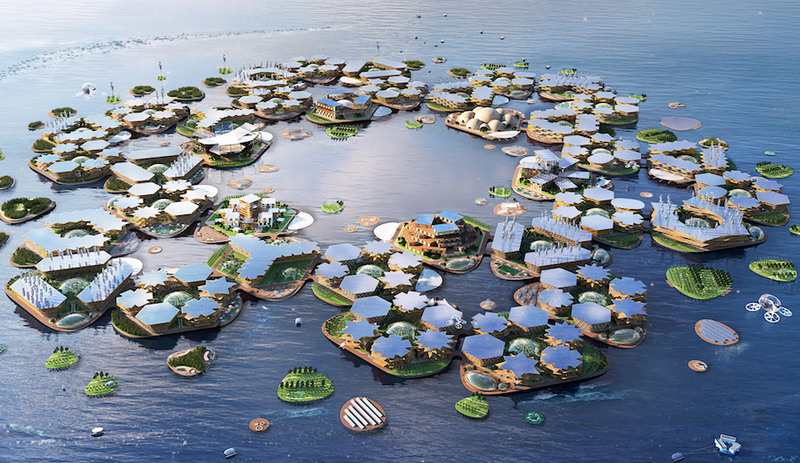 Since it was formed in 2001, Waterfront Toronto has opened up the city and re-naturalized former industrial dead zones. The completion of Athletes’ Village, on budget ($709 million) and on schedule, is more than just a milestone; it’s a vindication for an organization that has come under fire from gravy train–obsessed politicians who point out overspending with not enough signs of progress. 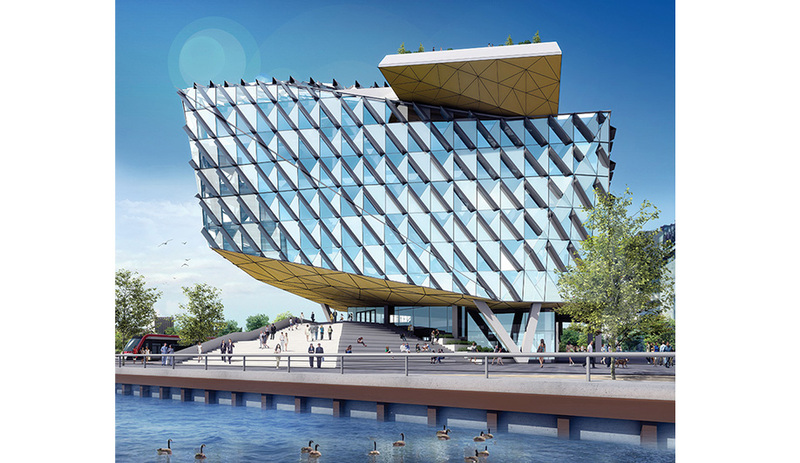 The city hopes to attract tenants from the high-tech sector with ultra-high-speed bandwidth capabilities at the Water­front Innovation Centre, one of the more eye-catching office complex proposals, designed by Sweeny &Co of Toronto. To Torontonians, the construction seems endless, until you consider that the 800‑hectare site is the largest continuous project in the world. As each of its more photogenic components is unveiled – the WaveDecks, Sugar Beach, Corktown Common – the bigger picture of laying groundwork to connect the three major precincts of Central Waterfront, East Bayfront and West Don Lands has continued more quietly. For 15 years, industrial zones have been remediated, streets repaved, sewer systems installed and trees planted to create one cohesive fabric. Most important, the vibrant parks and public spaces were carved out first, before private developers could come rushing in – and, thanks to the established infrastructure, they have. When all is said and done, the waterfront will be home to 40,000 residential units and one million square metres of commercial space, and it has already attracted $2.6 billion in private investment, twice the initial amount of public financing. The recently announced Waterfront Innovation Centre, designed by Sweeny &Co of Toronto and funded by Menkes Developments, is expected to attract more jobs and tenants in the creative and tech sectors. George Brown College’s school of health sciences, completed in 2013. The highly transparent building, designed by KPMB, is now used by 3,500 students. It was among the first non-residential projects completed along the lakeshore. As of yet, there are no swooping Zaha Hadid buildings or shiny Anish Kapoor beans. 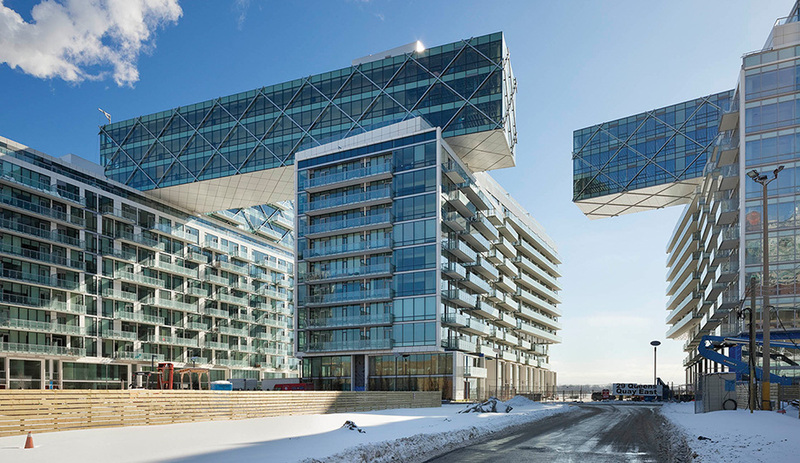 For all its Jacobsian “eyes on the street” urban planning, the Athletes’ Village exudes typical Toronto modernism, a multiplication of glass boxes with nary a curve or odd detail. “We knew if we could deliver this project for the lowest amount in terms of public expenditure, that would be a compelling proposition,” says Peter Clewes, principal at architects­Alliance, whose pragmatic viewpoint is widely held by local developers and architects. To reduce time and labour costs, the buildings employ standardized components and off-the-shelf exterior wall systems. And they have been selling before the games, to avoid the stagnant fate of Vancouver’s village after the Winter Olympics. 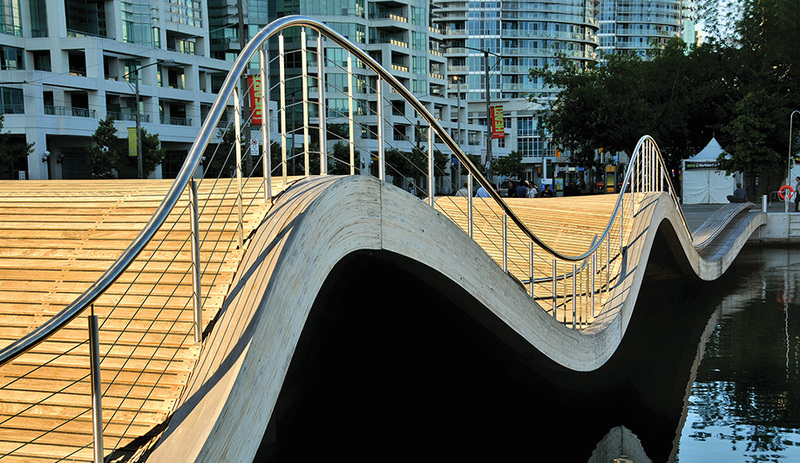 In place for a few years now, West 8’s WaveDecks are located along Queens Quay, one of the most tourist-friendly strips on the waterfront. The high-traffic promenade will be completed this June, with a 1.7-kilometre allée, fed by an underground system of Silva Cells to ensure that the trees mature and thrive. Rather than statement buildings, the vision is to build a tapestry of small but impactful moments. Finally slated for completion in June, the revamped Queens Quay, southwest of the downtown core, will unite streetcar tracks with a lakeside bike path and sidewalks paved in a granite pattern of giant maple leaves. The entire 1.7‑kilometre stretch will be lined by a double allée of trees, fed by an underground irrigation system. 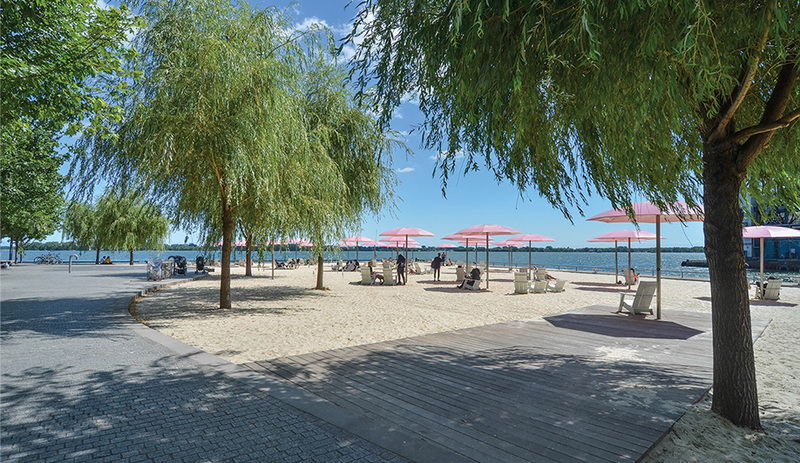 Sugar Beach, a triangular park filled with pink umbrellas and white sand, has won numerous awards since it opened. The park was designed by Claude Cormier + Associés of Mont­real. He’s not exaggerating. 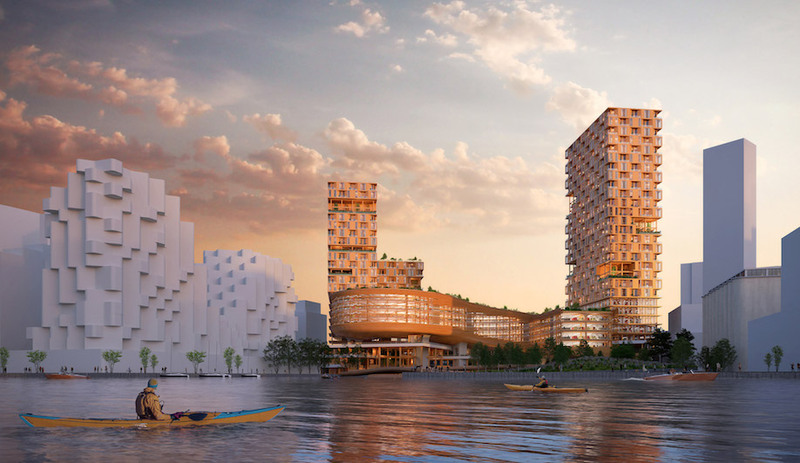 Waterfront Toronto’s next significant project is to re-naturalize the mouth of the Don and flood-proof the surrounding industrial lands and adjacent neighbourhoods. Within a decade, we will see this bizarre landscape of massive silos, beaches, parks and sailing clubs scattered across 125 hectares of depressing concrete morph into mixed-use communities with lush parkland, all connected to the rest of the city by public transit. 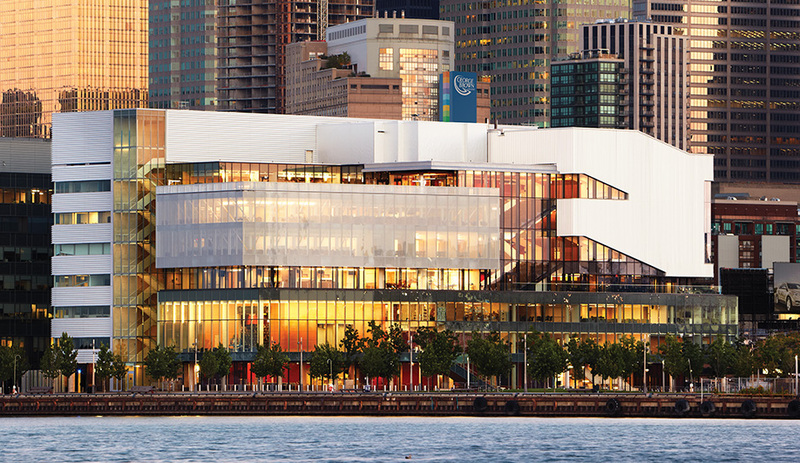 Pier 27, two sets of buildings, each topped with a three-storey horizontal tower. The design by architects­Alliance maximizes views of the lake with surrounding parkland that invites passers­by to wander down to the water’s edge. The initial master plan was approved in 2010, after New York landscape architect Michael Van Valkenburgh and urban designer Ken Greenberg won the international competition. Waterfront Toronto wasn’t moving fast enough for former mayor Rob Ford and his brother, Doug, who stepped in with dreams of their own, starring a Ferris wheel, and a monorail straight out of an episode of The Simpsons. Their showboating forced Waterfront Toronto to renegotiate its meticulously planned, environmentally sound vision. “They insisted on a value-engineered plan, which shrank the landscape a little, taking out the river’s curvilinear nature and containing the landscape in more of a box,” explains Greenberg. “Parts of the changes addressed technical issues, and parts were just in aid of political face saving.” But he is happy that the essence of the plan has survived.